We’ve all had that little competition with ourselves, walking round exhibitions trying to pick up as many free gifts as we can, but where are all those ‘freebies’ now and what company even gave them to you? How many of these ‘freebies’ have you actually kept and maybe more importantly have you ever called a company because their branded pen reminded you about their services? The answer might be yes or no – different promotional methods work for different companies, but many companies use small free gifts such as branded pens at exhibition stands without even thinking, it’s what everyone does, so why wouldn’t you? Just as with any form of promotion, you should be testing and monitoring which methods work for you rather than just choosing and sticking to something by default. We’ve detailed some ways you can think more constructively about which freebies might work for your business, and which alternatives might work even better. A traditional freebie such as a mug or a coaster could well be an excellent idea for your company – people use them in the office and they will stick around to remind people of your services. Ensuring good quality is therefore a priority, if they go in the bin after a few weeks they won’t do their job properly and your company will be associated with their quality. Don’t go for the cheapest option, offer something durable that will stick around and remind people of your company when they most need your services. In order to monitor success of promotional material, you can include a promo code or specific contact phone number or email on your freebies. A static trackable forwarded phone number can cost as little as £5 and mean you can track any calls resulting from your freebies, allowing you to truly judge their worth. Remember though that some enquiries come from many different forms of contact, so your freebie might support the enquiry but not be the final thing that leads to it – it still may be helpful for following up sales after the show if someone has your mug on their desk while talking to you. Instead of small individual freebies, why not give away one of your services as a prize, this way it gives you a great opportunity to see who is interested but also gives you a foot in the door to sell your services to these visitors in the future. If your services don’t work as a prize, a weekend away or gadget such as a tablet can work well too. You could incorporate your gift or competition into your lead generation tactic for the expo. This could be that they should put their business card in a box if they would be interested in your service and another if not. This way you will be collecting and sorting hot leads all in one go. 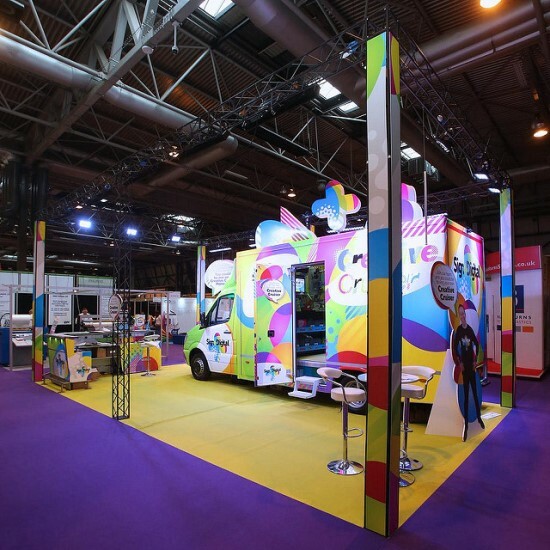 There may be other aspects of your exhibition presence that could do with attention before you even start looking at freebies and prizes – such as your actual stand. We may be slightly biased due to being a stand company, but we know just how much different a bold and attention-grabbing stand can make! Along with a stand that really works with your branding at the show, you should invest in excellent staffing. You can do everything right, but if the staff you have greeting people and talking to them don’t put across the right impression then your whole show experience will suffer. There are pros and cons to using free gifts at exhibition shows and it is completely dependent on your business, budget and what you want to achieve. Setting goals for the show beforehand will put you in the best position to decide whether you want to use free gifts on your stand, or whether you should be investing in another aspect of your show presence. Ultimately, it’s important to remember that just because a lot of businesses use free gifts doesn’t mean it works for everyone.